2019-01-31 00:44:282019-01-31 00:44:28https://quickbooks.intuit.com/in/resources/accounting-taxes/input-tax-credit-under-gst/Accounting & TaxesEnglishInput Tax Credit under GST means deducting the tax paid on inputs from the tax payable on the final output by a registered taxable person.https://quickbooks.intuit.com/in/resources/in_qrc/uploads/2019/01/iStock-624490712-1.jpghttps://quickbooks.intuit.com/in/resources/accounting-taxes/input-tax-credit-under-gst/What Is Input Tax Credit Under GST? What Is Input Tax Credit Under GST? Before the implementation of GST, goods under the indirect tax regime in India were subject to tax both by Centre and the States. Whereas services came exclusively under the ambit of the Central Government. As for the taxes levied on goods, Central Government collected taxes up to the manufacture stage. While the state governments collected tax on both intra state as well as inter-state sales. Hence, Central Excise, Customs and Service tax were the three main components of indirect taxes for the Central Government. While Value Added Tax (VAT) and Central Sales Tax (CST) were major taxes for the State Governments along with Octroi, Entertainment Tax etc. Such a complex tax structure resulted in multiplicity of taxes and most importantly cascading of taxes. The cascading effect did not allow you to set-off taxes paid on inputs against output tax payable on goods and services or vice versa. Moreover, taxes paid by you in one state were not available for set off against taxes payable in other state. to allow setting-off taxes throughout the value chain. That is to claim input tax credit (ITC). I. What Is Input Tax Credit? In order to avoid the challenge of ‘tax on tax’, Input Tax Credit (ITC) mechanism was incorporated into the GST system. The term ‘Input’ means any goods other than capital goods used or intended to be used by you in the course of your business. And the taxes paid on such inward supply of inputs, capital and services are called input taxes. These may include Integrated GST, Central GST, State GST or Union GST. Therefore, ITC means deducting the tax paid on inputs from the tax payable on the final output by you as a registered taxable person. This means as a recipient of inputs or input services, you can deduct the amount of tax paid on inputs or input services against the tax on your output. Aryaman, a wholesaler supplies goods worth Rs 2,00,000 to Binoy, a retailer. Binoy further sells the goods to Charan, a consumer, for Rs 2,20,000 after minor processing. GST @18% was applicable. Now, when Aryaman supplies goods to Binoy, he collects Rs 36,000 from Binoy against GST and pays the same to the government. When Binoy further sells the goods to Charan, he collects Rs 39,600 as GST from Charan. 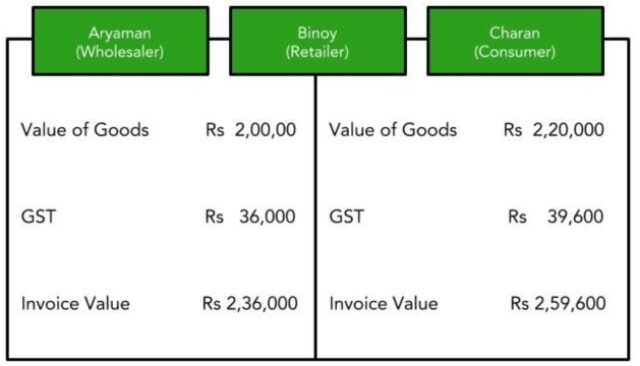 Since Binoy had paid GST on inputs, he can claim an input tax credit of an amount equal to the GST paid on the inputs i.e. Rs 36,000. The balance Rs 3,600 is paid to the Govt. by Binoy. 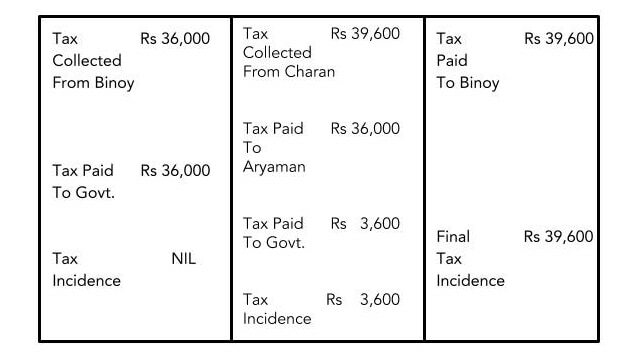 Lastly, Charan, the final consumer pays GST of Rs 39,600 to Binoy. It is quite evident that there is no incidence of tax on any of the interim parties – neither the wholesaler nor the retailer. The reason is that the tax that each of them have paid can be set off against their respective tax liabilities on output. Final incidence of tax is only on the end consumer. This clearly displays the removal of cascading effect of taxes that existed in the erstwhile indirect tax regime. Firstly, you must be registered under the GST law. Then, you must have the tax invoice or the debit note issued to you by the supplier of inputs or input services. You must receive the goods or services or both. Your inputs supplier must have paid government the GST charged in respect of such a supply. You should have filed returns as per section 39. In case you receive goods in lots or installments, you can claim ITC when the last lot is received. If you have claimed depreciation on the tax part of the cost of your capital goods, then you cannot avail ITC on the said tax component. You shall not be entitled to take ITC if the same is not claimed within the time limit. An Invoice issued by your supplier of goods or services. Invoice issued by you as a recipient of goods and services supplied by an unregistered dealer. Such a supply comes under reverse charge mechanism. This mechanism involves supplies made by an unregistered person to a registered person. A Debit note issued by your supplier in case the tax charged in invoice is less than the tax payable in respect of such a supply. A Bill of Entry or any similar document as required for integrated tax on imports. An Invoice or Credit Note issued by an Input Service Distributor as per the rules under GST. A Bill of Supply issued by a dealer opting for composition scheme or an exporter or supplier of exempted goods. Fail to pay your supplier within 180 days from the date of issue of invoice by the supplier. After the due dates for filing GST returns, the process for ITC matching starts. Online portal of Goods and Services Tax Network (GSTN) carries out the ITC Matching process. All your inward supply details as per GSTR 2 filed by you as a buyer are matched with outward supplies as per GSTR 1 filed by your supplier. If the details match, then ITC claimed by you as a recipient is considered valid. In case, there is a mismatch, the changes are reflected in GSTR 3. If you fail to deposit tax on due date or file return within time, then ITC can be denied. And in case any excess ITC is claimed, it is added back to your tax liability as a recipient. Your CGST liability can be extinguished by first utilizing ITC standing under CGST and then under IGST. 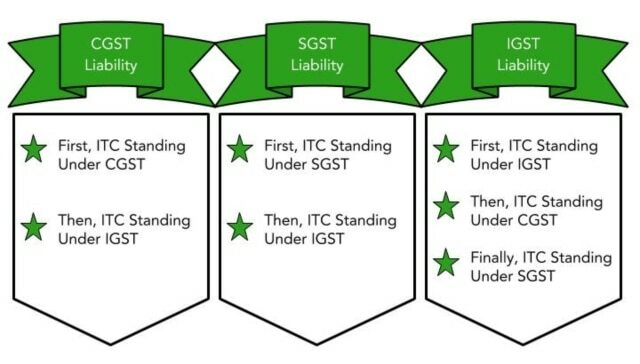 Similarly, your SGST liability can be terminated by first using ITC standing under SGST and then under IGST. Finally, your IGST liability can be exhausted by first using ITC standing under IGST. Then, you can utilize ITC existing under CGST and lastly the ITC standing under SGST. This case relates to the principal manufacturer who sends the goods to a job worker for further processing. In case you as a Principal manufacturer do so, you can claim ITC against taxes paid on the purchase of such goods sent to the job worker. You can claim ITC even if you sell the final goods directly from the job worker’s place. That is without bringing the goods back to your (principal’s) place of business. This concept relates to a company that has multiple units or offices. The Input Service Distributor (ISD) refers to an office that receives multiple invoices from the suppliers for the supply of goods and services to the company. Such an office can be any branch office, head office or registered office of the company. Now, when ISD claims ITC for the inward supply of goods and services, it distributes the credit to the beneficiary units. The distribution of ITC among the beneficiary units is done on the basis of the units’ previous year’s turnover. The ISD shall distribute the credit under different categories like CGST, SGST, UTGST, IGST or Cess. ITC can be claimed on the inward supply of capital goods. But, where the depreciation has been claimed on the tax component of cost of capital goods, no ITC will be allowed. This case relates to the one where there is a change in the constitution of a registered person due to sale, merger, amalgamation, lease or transfer of business. In such a situation the said transferor shall pass on the unutilized ITC in his electronic credit ledger to the transferee.